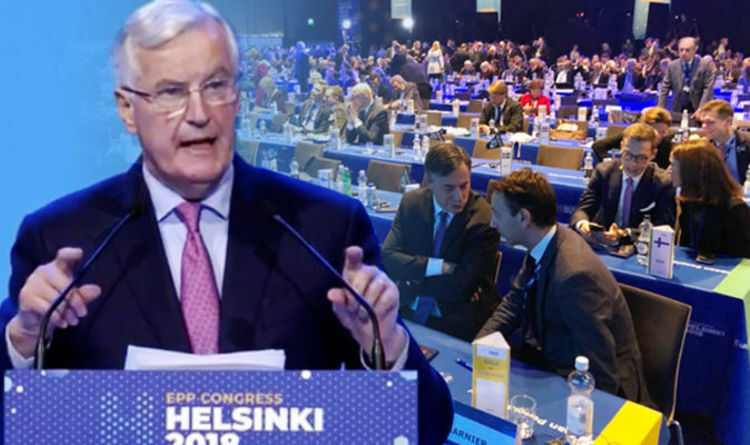 Michel Barnier was addressing the European People's Party (EPP) Congress in Helsinki on Thursday when he was ignored by members of the room. German Chancellor Angela Merkel even “walked off” during the European Union chief Brexit negotiator’s speech, to speak with Manfred Weber. Euronews’ Political Editor Darren McCaffrey said: “The most extraordinary thing about Barnier’s speech, literally NO-ONE is listening, I mean NO-ONE!!! “And look at this... Manfred Weber having his picture taken right in front of Barnier - as he talks, as he struggles to hold the room. Addressing the European People's Party (EPP) Congress in Helsinki on Thursday, the Frenchman said: "No time for jokes, the clock is ticking, not only for Brexit. Together, united, we will win this election. “We’ll have to fight against those who want to demolish Europe with their fear, their populist deceit, their attacks on the European project. There is now a Farage in every country. In every country." Mr Barnier insisted the EPP – the largest political group within the European Parliament made up primarily of Conservative politicians from across the EU – will have to unleash all its political strength to win the trust of EU citizens. He continued: "We must also respond to those who think defending Europe belongs to one single party. More thane ever before, Europe needs the EPP’s founding vision. "We are European patriots. Patriots and Europeans. We need our nations to fight nationalism, we need our nations to build Europe. Europe is at a moment of truth." Earlier this week the French negotiator revealed details of a tense encounter with the former Ukip leader Nigel Farage, in which the British MEP insisted "the EU will no longer exist" after Brexit. Prime Minister Mrs May has struggled to secure a Brexit deal with the European Union with the Irish border remaining a major sticking point in discussions. This week ministers were invited to the Cabinet Office in Whitehall to view a near-complete draft of the proposed EU withdrawal agreement. The document, which they saw in strict secrecy and were not allowed to take copies of, is believed to contain the "95 percent" of the exit deal Mrs May says has been agreed with Brussels. But it is not believed to have included the proposed Irish border solution.